A glance at a watch can give a runner all kinds of information. The workouts should have been uneventful. But when two-time Olympian Desiree Linden ran repeats on a rural road in Charlevoix, Mich., they went slower than she expected. Linden returned to her home base in Rochester, Mich., huddled with coach Kevin Hanson, and trained with her teammates on familiar courses. To her surprise, she crushed workouts there. Turns out, one of the most commonly used pieces of running technology, a GPS watch, had given Linden an inaccurate read on her fitness. In Charlevoix, she measured distances with her watch, but the satellite connection there was unreliable. She was catching a bad signal, though she didn’t know it at the time. Every runner with a GPS watch can relate to what Linden went through a couple of years ago, the sense that you’re fitter than what your watch indicates, the quirks in technology messing with your mind on training runs, and even in races. And every runner can relate to the extra motivation and confidence that comes when the mile splits on your GPS watch are faster than you feel or you beat someone on a Strava segment. The 2017 National Runner Survey reported that 59 percent of respondents trained with a smartphone and 51 percent wore a smart watch, which typically carry running apps or function as GPS devices. That means runners are collecting more data points to measure performance, utilizing more resources to monitor training cycles, and sharing more runs via social media. Marathoner Scott Mindel, 31, is never without his GPS watch, whether running in the Boston suburbs or aqua jogging. He wants to know his distance and pace, but he has tracked his heart rate, elevation changes, sleep patterns, and how his effort translates from hilly to flat terrain. Mindel believes technology has made him a better runner because he’s self-coached and can go back and compare training cycles in a very detailed way. He hopes to run a personal best, something around 2 hours and 20 minutes, in Monday’s Boston Marathon. Once you do, there’s probably a product for that. If you ask 1968 Boston Marathon champion Amby Burfoot what has been the best piece of running technology to come along, he doesn’t hesitate. “Breathable socks and breathable shirts,” he answered. Point taken. It’s important to remember that technology for runners encompasses more than gadgetry. But we’re in the age of the quantified self, and wearables and running apps are where it’s at. There are now products that can monitor your hydration levels in real time, effectively measuring just how well your breathable socks and breathable shirts are working. It’s easier to argue that no piece of running technology has changed training more dramatically than GPS watches, which track time, distance, and pace. GPS watches have come so far so fast that runners often laugh when you ask about them about the device’s evolution. Many still remember the watches of five or 10 years ago, the bulky models that make it look and feel as though you were carrying a mini-computer on your wrist. And compared with today’s sleek devices, they didn’t do all that much. Now, if there’s a feature you want — such as measuring each stride’s ground-contact time, estimating VO2 max, receiving texts, playing music, or getting training analysis — there’s a watch that will give it to you. On the go, however, most runners focus on the basic information. Think time, distance, pace, elevation, stride cadence, and heart rate. GPS watches allow runners to train more accurately and intelligently. Still, it can be tough to avoid the running equivalent of the tail wagging the dog — the data dictating effort and how you feel about your training. Depending on the day and the workout, the technology that runners use can be an angel on their wrist or a devil. GPS watches and other tracking devices can push you to better workouts or keep you from going too fast and getting injured or put a slower-than-expected run in perspective when you look at an elevation chart. But they can also replace the experience and feel inform your training and racing, and sow self-doubt when runs go poorly. And it’s not just elite runners and their coaches who appreciate all the data yet recognize potential pitfalls. The same goes for regular runners who are communicating with coaches via running apps or coaching themselves. The 2017 National Runner Survey, which polled more than 6,800 runners, looked closely at runners who use apps. Out of those, 82 percent said they used apps because they wanted to track all of their statistics, 65 percent said they believed apps helped them train better and avoid injuries, 61 percent said it made them feel good to see what they ran via apps, 17 percent said they liked to share their running information with others on social media, and 15 percent liked to see how they compare with other runners. If you’re looking to share and compare, Strava will help you do that. Strava promotes itself as “the social network for athletes.” The company says millions have signed up to track and share their workouts with fellow runners, cyclists, and triathletes. And it can get quite competitive when athletes create segments — portions of any training route with designated start and end points — then vie for the fastest times on those segments. As part of his regular training routine, Olympic marathoner Dathan Ritzenhein uses a GPS watch, an AlterG treadmill, and an artificial altitude training device. The AlterG, an anti-gravity treadmill, lets Ritzenhein train at less than his actual body weight. The artificial altitude training setup is basically an oxygen mask attached to a special machine that simulates the air at higher elevations. However, Ritzenhein had to pull out of Monday’s marathon because of injury. Trying to stay healthy while pushing for peak performances is one of the toughest parts of running. And that’s one reason why tracking strain and sleep has become popular among athletes, especially endurance athletes who often stress their bodies to the max and need quality sleep for recovery. Boston-based WHOOP makes a fitness band that collects massive amounts of data that tell users how much strain their body experiences during the day and how much sleep it will take to fully recover. “WHOOP has made me aware of how to schedule workouts more effectively and what I should do when I have a hard workout the next day,” said Newton-based marathoner Mark Vautour, 38, who started using the product about a year ago and expects to run under three hours in Boston Monday. Looking ahead to next big thing at the intersection of running and technology, Vautour and other marathoners are curious about products such as Nike’s Zoom Vaporfly 4% shoes. It’s the footwear Shalane Flanagan wore when she won the New York City Marathon last November. The technology is in the engineering of the sole, with layers of lightweight foam sandwiching a spoon-shaped carbon-fiber plate. According to Nike, and a study out of the University of Colorado-Boulder, the Vaporflys make runners 4 percent more efficient. Because of that, they theoretically make runners significantly faster. But do the 4% percent shoes cross a line when it comes to performance enhancement through technology? 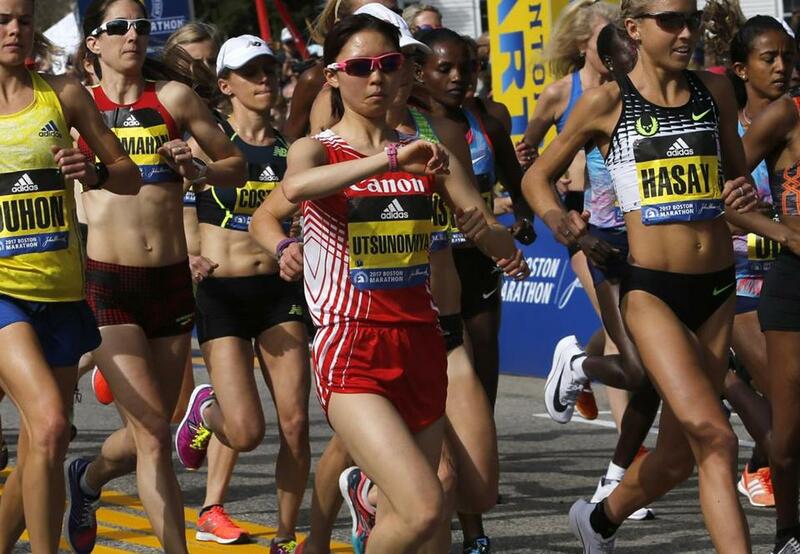 Do they give runners an unfair advantage? That’s an ongoing debate in the running world. And it’s not the first or last time new technology will raise questions about what’s fair in running. Burfoot is focused on the opposite end of the body when it comes to the future of technology for runners. “The brain is the new frontier,” said Burfoot, who mentions a device that promotes itself as priming the brain for better neuromuscular connections. “We used to be all about the legs and the heart. Runners everywhere may soon find out.